With the well-known dominance of Amazon and Kindle in the ebook market, and particularly in its almost ever-present social media mentions, there is a natural assumption that this is a worldwide phenomenon and that ebooks and self-publishing must always lead to the Kindle Store and Amazon authors. However, in my judgement, this is simply not true. The popularity of the Kindle as a reading device is predominantly in the United States and some other English language markets. Where I live in Europe, and I have heard the same from some of my UK friends, the Kindle is an infrequently seen device. Amongst my friends and family, both in Switzerland and Australia, not a single person I know owns a Kindle. While waiting in airports in Europe, I have hardly ever seen anyone reading with a Kindle. On the occasions I have shown my old keyboard Kindle to my French speaking friends, they usually have the same reaction. Total disinterest. Their reasons are quite logical though. Firstly, there is still a preference for books in Europe, so ebooks are struggling for acceptance. Secondly though is that they think a Kindle, in any of its forms including Kindle Fire, look and feel cheap and don’t do much. But are there enough readers outside the US who read in English? What is the current ebook market share of Amazon Kindle? But, if I started writing this piece all over again and talked about the Apple iPad, it would be a totally different story. All of my friends and family have an iPad. All of my French speaking friends too, and they occasionally read ebooks with it. I see almost one person in five using an iPad while waiting at an airport in Europe. The rest almost always have an iPhone or Android. I see people on trains reading on iPads and iPhones – and, perhaps reading ebooks in French and German, as well as English. So because of this, I know why self-publishing and book sales are not simply Kindle and Amazon KDP publishing. Sure, it’s one very important publishing platform, but one that is basically limited to a US-centric readership and very often, Prime members. The rest of the world is equipped and ready to read, and buy ebooks but not only on Amazon. Smart self-publishers know this and are already publishing on a number of platforms and online retailers. The next stage of growth in ebook sales will come from markets other than the US, and it will not be driven by dedicated e-reading devices, but by fully functional tablets and smartphones that also serve as a multi-platform ebook reader and allow ebook buying choice. With a Kindle, you get protected Kindle ebooks. With a tablet, you can probably buy the same ebook from a range of retailers, and perhaps even DRM-free, so you can use a purchased ebook on almost any device and safely back up and store your library. You can even lend it to a friend. As a result of a marketing experiment I worked on a few years ago using BitTorrent, the following graphic shows the geographical location of over 20,000 downloads of one of my free ebooks over the period of a few weeks. The ebook was in .epub and .mobi format so it could be used on almost any e-reading device from smartphones to laptops. What this proved was that there were a lot of readers of English ebooks out there and that there was a rapidly developing market. Note: I would not suggest using BitTorrent now as P2P is blocked on most modern browsers as it is a prime source of viruses and malware. Readers are all potential buyers, and there are millions upon millions of them outside the US. As a self-published author though, are your ebooks available for them or are you only an Amazon KDP author? While it is perceived common knowledge that Amazon Kindle dominates ebook sales, the truth for self-publishing authors is surprisingly not as you might think. There is a big potential market for ebook buyers on retailers other than Amazon. This graph below is worth studying. 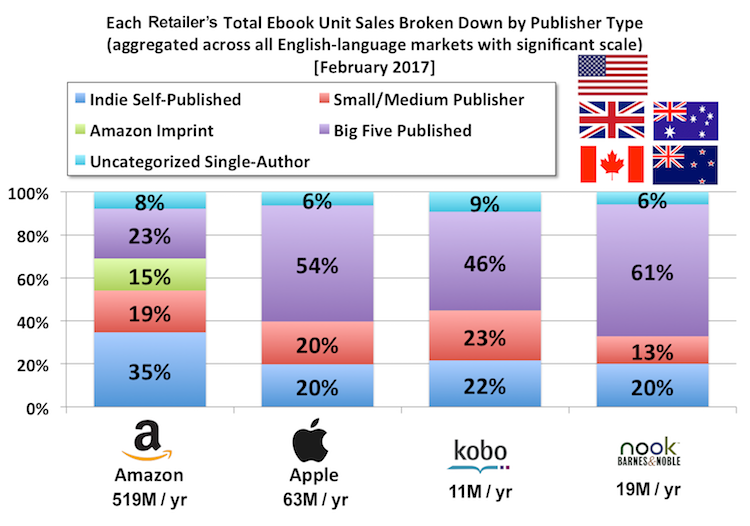 The graph above comes from the 2017 Author Earnings Report and what it clearly indicates is that Apple, Kobo and Nook readers buy a lot of self-published titles. Are you connecting with these buyers? Well, self-publishing is not only Kindle. Smashwords and Draft2Digital are distributors, or more correctly, aggregators of ebooks. You can read my review of Smashwords and Draft2Digital. However, after self-published authors publish their books to either of these aggregators, they seem to expect, as if by some kind of magic, that their ebooks will instantly start selling. While lazily filling their social media feeds with links to their books on Amazon Kindle, most Indie authors can’t be bothered, or don’t even know how to promote their ebooks on other retailers. Simple question. How many authors know how to create a link to their books on the Apple iBooks Store? For those who don’t know, perhaps a look at Apple’s Link Builder might help. Second question. What percentage of self-published authors’ book promotion is linked to Amazon? Nearly 100%? I’ll answer this question from my experience. I run a book promotion site for self-published authors, and each submission has four optional links available for each book. Of the last 200 or so books that have been published on the site, only two included a link to Barnes & Noble and exactly zero included a link to Apple or Kobo. Of course, all 200 included a link to Amazon. Third question. There are thousands of free Kindle ebooks every day, all being offered by KDP Select enrolled authors. But do any authors who are not in KDP Select think about offering a free book through Smashwords or Draft2Digital? It’s easy and comes with no strings attached, and more importantly, no necessity to grant exclusivity. Simply change the price to free for as long as you want. Fourth question. What do self-published authors expect from Smashwords and Draft2Digital? Miracles? Yes, I agree that a lot of self-published authors don’t sell many books on distribution channels. But it’s easy to understand why, isn’t it? Yes, Amazon and Kindle are big. Very big. So logically if you want to sell ebooks you need to have your ebooks available on Amazon. However, there is more to the ebook market – about 30% more, where a little ebook promotion can help add to your income. But it won’t happen if you don’t give it a little push. An easy way to spread the word about your ebooks on Apple, B&N, Kobo or any other retailer your ebook is available from, you can use universal book links to give book buyers a choice of retailers. So think about what you can do. Perhaps make one of your ebooks free on Apple, Google Play or Nook for a week or two to see if you can attract new readers. Use links to your ebooks on Apple, Kobo or Google Play from time to time on Facebook or Twitter. In other words, spread the news about your ebooks a little further than only on Amazon Kindle. You might be pleasantly surprised at the result. Just because someone has an iPad or iPhone, doesn’t mean they can’t read Kindle books. I have the Kindle App on mine and read more ebooks with that than the iBooks App. I don’t like Amazon – for the usual reasons – and in fact sell more books through Draft2digital. Hardly any, but still more than with Amazon. Great advice, but as others have said, Kindle books can be read on various apps (I read mine through both PC and Android Phone). Furthermore, KDP Select has some benefits, and it would be worth to analyse those versus being on Smashwords. I’m new to self publishing so this was an eye opener. Thank you. Thanks. I don’t wish to publish on kindle but was not aware of alternatives. I will investigate these now. Thank you. I had no idea that a self publisher could have their books published on more than just one, ex: Nook, Kindle, Kobo, etc. I was under the impression they were all exclusive to even self publishers. Thank you very much for setting me straight.